"The most delicious waffles! Usually served as a snack or dessert. Also try them with Korean red bean paste instead of the banana, it's even better! I remember eating these while visiting Korea, and recreated the taste at home." Preheat waffle iron. In a large mixing bowl, sift together flour, baking powder, salt and nutmeg. Stir in milk and eggs until mixture is smooth. Spray preheated waffle iron with non-stick cooking spray. 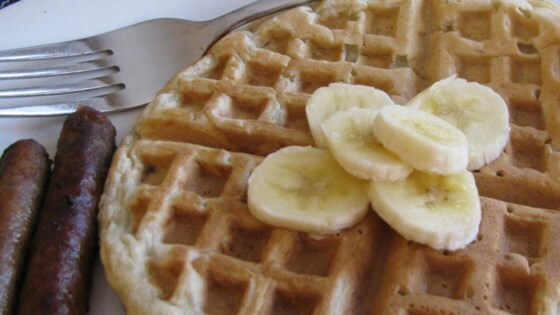 Pour two tablespoons of the waffle batter onto the hot waffle iron. Place two slices of banana on top of the batter and then spoon another two tablespoons of batter on top of the banana. Cook until golden brown. Serve hot. Makes great Waffles. Instead of slicing the bananas I mashed them up and mixed them in. I also added some oil to the mix to make it nonstick. My whole family loved them. This was a great recipe, super easy. I mashed the bananas and added cinnamon and vanilla extract. My two year old and husband loved it!